In the midst of negotiating the resolution of the War of 1812 with Great Britain, U.S. Minister to Russia John Quincy Adams wrote home to his father, the nation’s second president. “The whole compass of the diplomatic [still?] employed by the British Government in this negotiation has consisted in consuming time, without coming to any conclusion,” Quincy Adams wrote from Ghent, Belgium, on October 27, 1814. 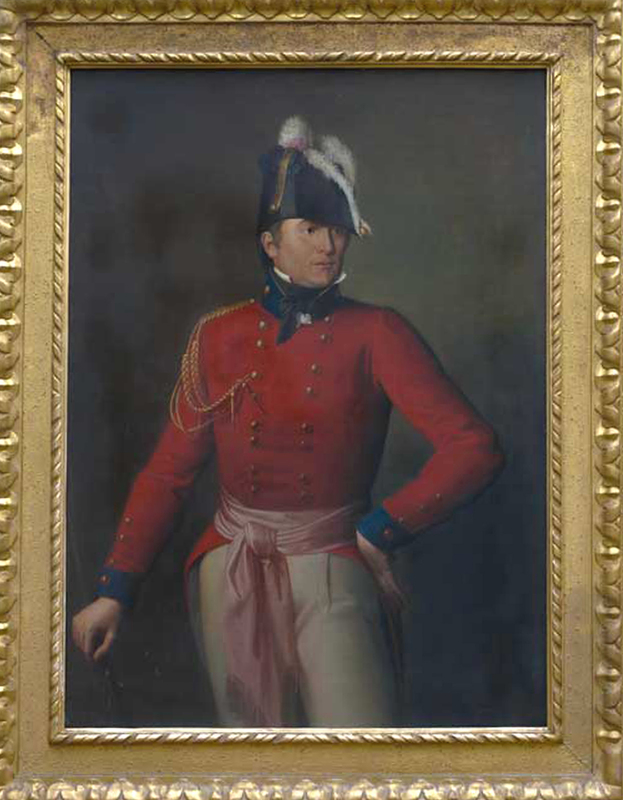 He went on to explain the last year of trying, and mainly waiting, to configure a resolution: Lord Castlereagh, the British Foreign Secretary, had proposed the negotiation in November 1813, eleven months before and less than a year and a half into the war. 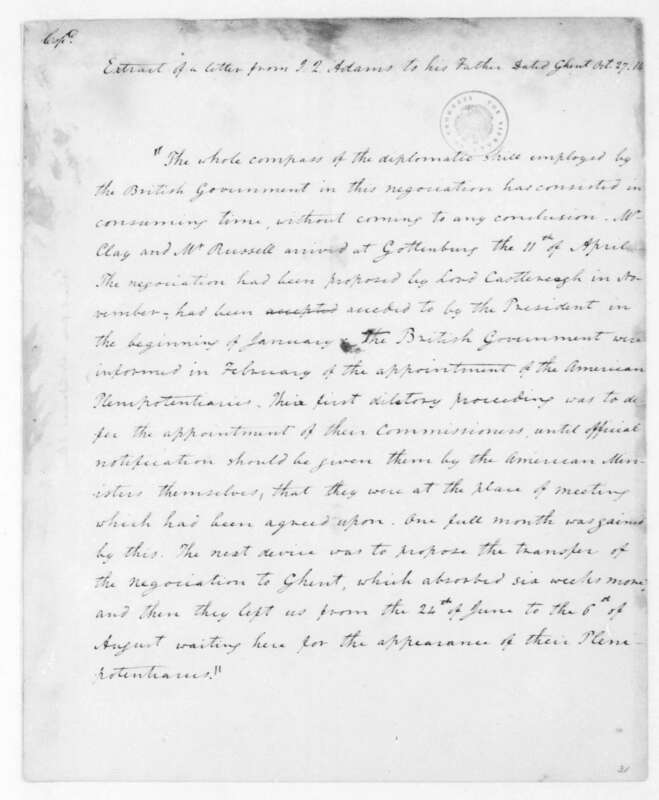 The following January, President Madison had agreed to settling the dispute. In February, the British government had been informed of the appointment of the American ambassadors (or “Plenipotentiaries,” as they were called). The British negotiators then spent an entire month delaying the appointment of their commissioners until the American Plenipotentiaries gave them official notice that they were at the “official meeting place” which both sides had agreed upon…but then they spent six weeks moving the operation to Ghent. Diplomats Henry Clay and Jonathan Russell arrived in Gothenburg on April 11. 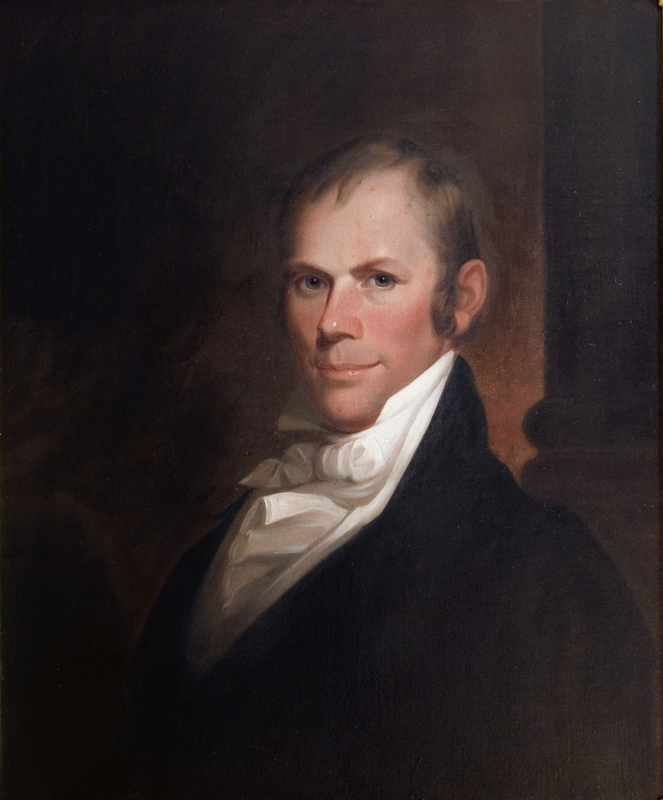 Finally, wrote Quincy Adams, the British representatives “left us from the 21st of June to the 6th of August waiting here for the appearance of their Plenipotentiaries.” And after all that, what did the Americans finally gain? Adams was understandably exasperated. For such a drawn-out process, the Americans only wanted one simple goal: to restore conditions to the way they had been before the war. In the final draft of the Treaty, neither side lost or gained territory, so the Americans eventually got what they’d asked for—unlike the British, who entered negotiations hoping that each side would keep what it had won during the war. The final resolution of 11 articles, titled the “Treaty of Ghent,” was signed by the Plenipotentiaries on December 24, 1816. Common myth therefore has it that the Battle of New Orleans on January 8, 1815—the huge American victory which turned Andrew Jackson into a hero—actually occurred after the war had ended. 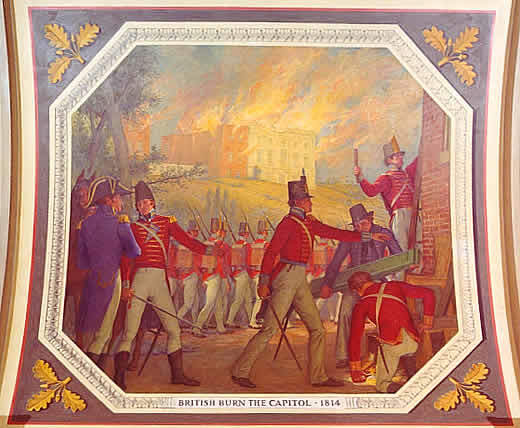 However, because neither Great Britain nor the United States officially ratified the peace treaty until after the battle—Great Britain on January 27, 1815 and the United States Senate on February 16, 1815—the battle of New Orleans can still technically be considered within the confines of the War of 1812. To resist the Orders in Council. To oppose the practice of Impressment. Clearly, for all of Quincy Adams’ waiting and frustration, the United States did in the War of 1812 what it set out to do, and the “Honor of the Nation” was reassured. (Less well known is that the second objective in the war, “to resist the Orders in Council,” had been a moot point for two years. Almost as soon as the war began, the British had repealed the Orders in Council, which had curbed American trade with Europe.) The last war between the United States and Great Britain had ended. Adams, John Quincy. John Quincy Adams to John Adams, October 27, 1813. Extract. From Library of Congress, The James Madison Papers. (accessed May 7, 2013). “All the Points Gained.” Daily National Intelligencer, February 23, 1815. 19th Century U.S. Newspapers (GT3017472560). Horwitz, Tony and Brian Wolly. “The 10 Things You Didn’t Know About the War of 1812.” Smithsonian.com, May 22, 2012. (accessed May 8, 2013). “Transcript of Treaty of Ghent (1814).” http://www.ourdocuments.gov. (accessed May 7, 2013). “The Treaty of Ghent.” National Park Service. Last updated April 24, 2013. (accessed May 7, 2013). “The Treaty of Ghent.” The War of 1812. PBS. Last updated 2013. (accessed May 7, 2013). 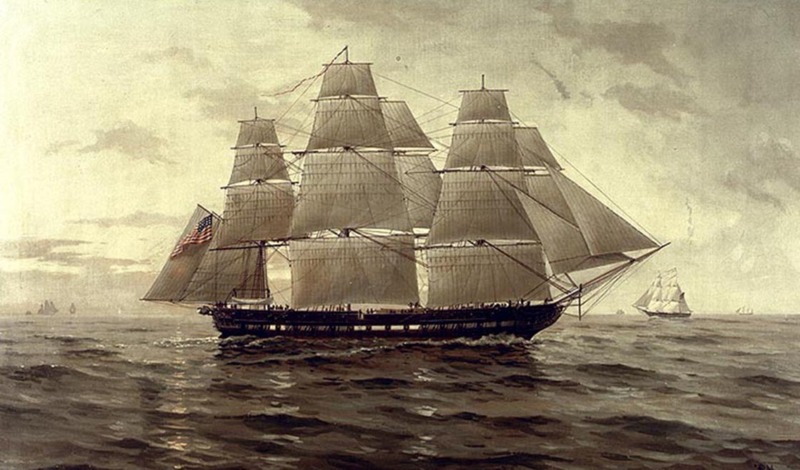 Another post in our occasional series on the War of 1812–part two of the story of the USS Constitution! Following the USS Constitution’s noteworthy escape from a five-ship strong Royal Navy squadron, Captain Isaac Hull, unable to keep his rendezvous with Commodore John Rodgers’ force, took his ship into Boston for provisions. Hull remained there for the rest of July, awaiting further orders; however, “not finding any specific orders waiting for him, and fearing being blockaded by a superior force, he quickly put to sea” (Gardiner 40). Hull planned on linking up with Commodore Rodgers’ force at sea or, if unable to do so, to cruise against British shipping coming out of Canada. Upon hearing of a nearby British squadron, which he assumed to be the very squadron Constitution had just escaped from, Hull decided to cruise further south. After sailing for a couple of weeks, on August 18 the Constitution gave chase to an unidentified ship; after pursuing her for two hours, the Constitution discovered that the unknown ship was in fact the American privateer Decatur. 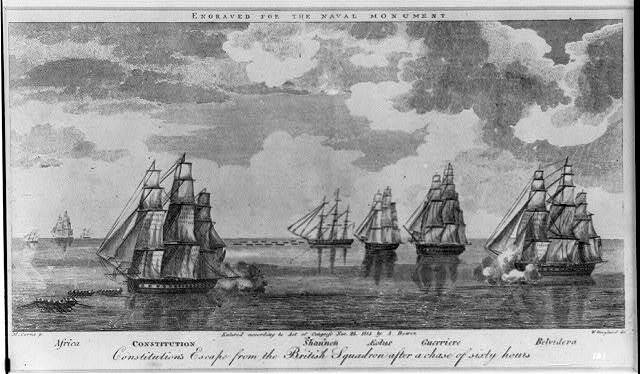 Despite the disappointing results of this fruitless chase, the Decatur informed Hull of a British warship which she had sighted the previous day, and the Constitution promptly set off to investigate. Early in the afternoon the next day, August 19, the Constitution “sighted a ship to the east standing westwards, and crowded on sail to close with the stranger” (40). 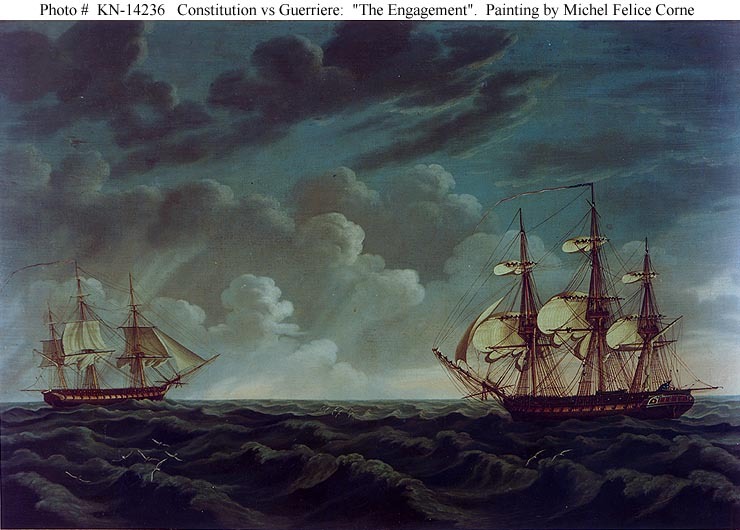 A couple hours later, she was discovered to be a large frigate, the HMS Guerriere, “which with great confidence had backed her main topsail and lay in wait for the American ship to come down” (40). The 38-gun frigate HMS Guerriere had originally been a French warship, but in 1806 she was captured by the British frigate HMS Blanche. After a repair and refit, she was commissioned into the British Royal Navy; “she was not a particularly large frigate even by European standards, carrying a main battery of thirty 18-pounders (although two were bow-chasers that could not be fired on the broadside)” (40). 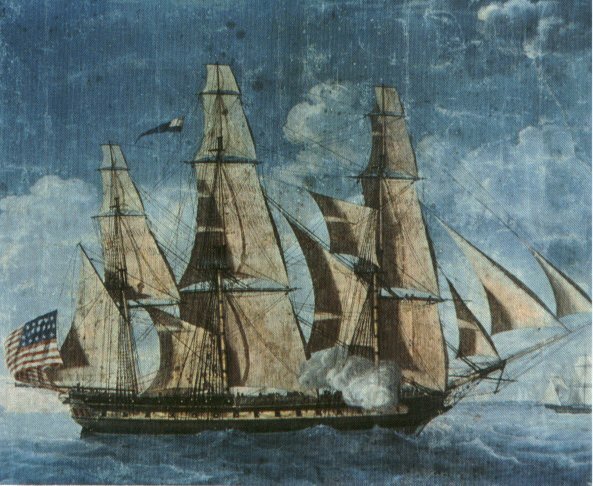 The Guerriere continued to play a role in the Napoleonic Wars, capturing a couple of French privateers in the West Indies during her service with the British before being transferred to Halifax in 1810. In 1812, after six years of service in the Royal Navy, the Guerriere was in a poor material condition; “like all French-built ships, Guerriere was lightly constructed,” and was actually “en-route to Halifax for a refit” when she encountered the Constitution (40-41). 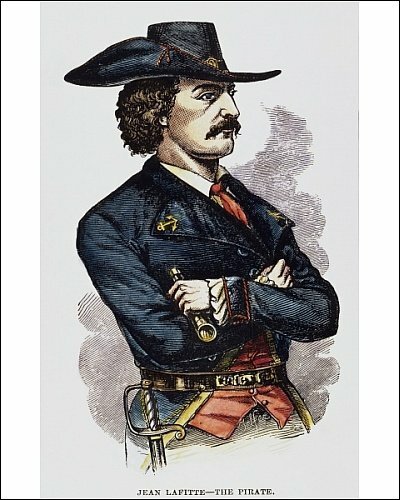 At the time of her encounter with the Constitution, Guerriere was under the command of Captain James Richard Dacres, a very seasoned and skilled officer (40-41). As Hull carefully approached the Guerriere, “reducing to fighting sail and double reefing his topsails while clearing for action,” Dacres foolishly wasted his opening broadsides, “firing too early to inflict any damage, possibly because he was more intent on outmaneuvering the Constitution and taking the weather gage, the favoured British position” (40). Hull, however, a seasoned seaman himself, skillfully prevented this positioning through maneuvers that forced the Guerriere to “bore up at about 6pm;” shortly afterwards, the “Constitution ranged up on her opponent’s port side within pistol shot” (40-41). The two ships then began to exchange close-quarters broadsides, and Constitution’s greater firepower quickly took its toll; despite the fact that Guerriere’s well-drilled crew was “firing three broadsides for every two American,” she simply “was not accurate enough to redress the balance in weight of metal” (41). After about 15 minutes, during which time the Guerriere suffered very damaging fire from Constitution’s guns, her mizzen mast was shot away and “went by the board, and Constitution forged ahead, turning across her bow in a perfect raking position” (41). With her fallen mizzen mast acting like a rudder and dragging her around, the Guerriere was unable to shadow the Constitution’s maneuver, allowing the Constitution to rake her with a deadly close-range fire for almost half an hour. Desperate, Dacres tried in a last futile effort to prepare a boarding party, “but as the boarders were assembling, the main mast fell forwards taking the fore mast and jib boom with it,” sealing the British frigate’s fate (41). Hull, rather than pounding the helpless Guerriere, decided to haul off to repair Constitution’s rigging; after about half an hour he returned to find out whether or not the Guerriere had decided to surrender. When Lieutenant Read, Constitution’s boarding officer, arrived on the Guerriere’s deck and inquired as to whether or not she had struck her flag, Captain Dacres, surveying his ship’s miserable condition and possibly in shock, reportedly replied, “Well, I don’t know; our mizzen mast is gone, our main mast is gone, and, upon the whole, you may say we have struck our flag” (41). All told, Guerriere’s crew had suffered casualties of 15 dead and 63 wounded, “the majority according to Dacres being sustained from grape and musketry when Constitution lay off the British frigate’s bow,” while Constitution in comparison had only 7 dead and 7 wounded (40-42). Gardiner, Robert. The Naval War of 1812. Annapolis: Naval Institute Press, 1998. 40-42. 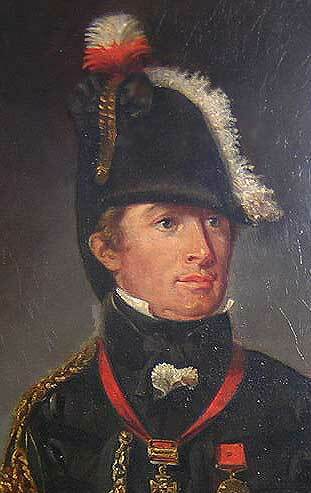 Welcome to the first post in an occasional series about the War of 1812. 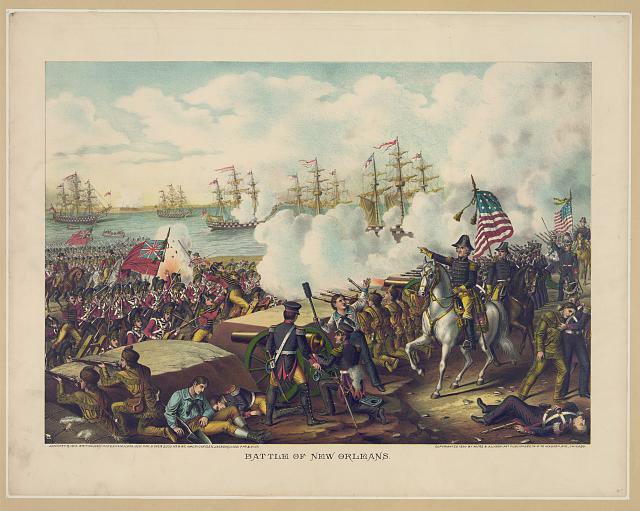 The USS Constitution’s first action of the War of 1812 was noteworthy, though far from the glorious victory over a British warship that she was looking for. On July 5, 1812, less than a month after Congress declared war on Great Britain, the Constitution sailed from Annapolis under the command of Captain Isaac Hull. She was supposed to link up with Commodore John Rodgers’ naval squadron, but unluckily, on July 18 she ran into “a strong British squadron off the Jersey coast under Captain Philip Broke.” (35) This squadron consisted of the 38-gun frigate HMS Shannon, the 64-gun ship of the line HMS Africa, the 32-gun frigate HMS Aeolus, the 36-gun frigate HMS Belvidera, and finally, the 38-gun frigate HMS Guerriere. The Constitution immediately fled from the hotly pursuing squadron, beginning what eventually turned into an epic three-day struggle to evade capture by the persistent British warships. 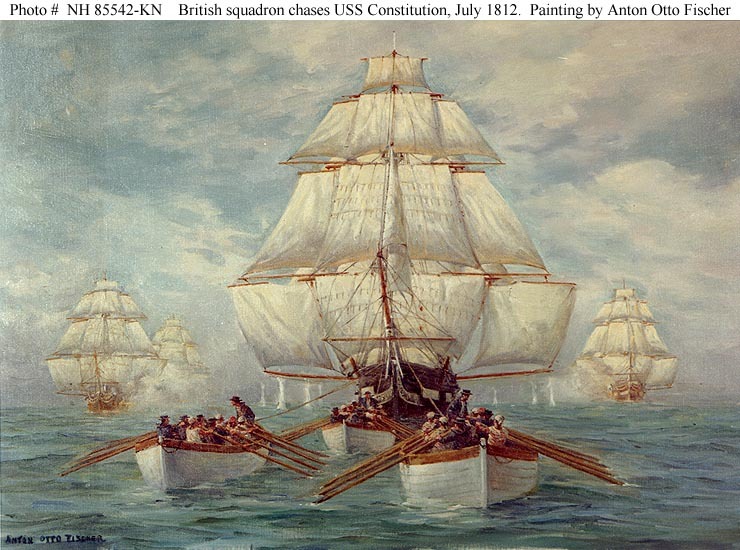 Over the next three days the Constitution’s captain and crew employed a myriad of methods in their attempt to outrun the pursuing squadron; first, Hull resorted to boats to tow the Constitution, but the British quickly followed suit. Many of the more distant or slower ships even sent their boats to assist the nearest frigate, the Shannon. Eventually, both sides “turned to the backbreaking expedient of kedging – carrying small anchors ahead in the boats, and then heaving in on the capstan (35).” Although they occasionally crept closer from time to time, even to the point that they were able to fire off a few shots at the elusive American frigate, despite their best efforts, the British pursuers simply could not close the gap on the Constitution. By July 19, “in gradually rising winds the Constitution was gaining;” on July 20, “Captain Hull set his crew to wet the sails, to retain more wind, and by the middle of the morning the American frigate was so far ahead that the British squadron gave up the chase and returned to their blockade station off New York.” (36-37) Hull, unable to keep his rendezvous with Commodore John Rodgers’ force, decided to head for Boston, relieved to have escaped his British pursuers. Robert Gardiner, The Naval War of 1812 (Annapolis: Naval Institute Press, 1998), 11-37.